Travel Agency Maryland: Montego Bay Fun in the Sun! Are you looking for your next adventure? We can help! Dreamers Travel is a full-service travel agency in Maryalnd that can do all the time-consuming planning for your next getaway. We offer travel agency services for destination weddings, family vacations, cruises, excursions, and tours. In this week’s blog, we’ll focus on just one of the many exotic destinations we can send you to have the time of your life. The inspiration for memorable reggae songs, Montego Bay, is a peaceful town that is equal parts tourist destination (courtesy of the cruise ships), historical gem, and tropical paradise. You can lay on the beach with a drink in your hand or explore the historic areas of the town and meet the friendly residents of this charming town. We can set you up with your adventures to delight, soothe, or excite you, depending on what your desires are. Get out on the water to see the expanse of the sea and the creatures that live there. 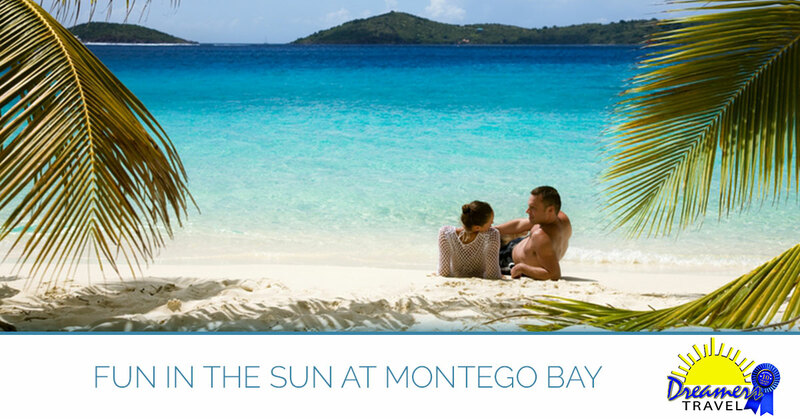 We can set you up with a package that will get you out onto the gorgeous blue seas around this Caribbean island. You can choose a Reggae Catamaran Cruise, The Lover’s Rock Catamaran Cruise, the Deep Sea Sport Fishing Cruise, or a private, exclusive day on a 46’ yacht or sailing catamaran. If dolphins are your spirit animal, we can set you up on one of five dolphin adventures, or if you wish, you can do any combination of dolphin-themed adventures. You can tour Dolphin Park Admission or a knee-deep dolphin encounter with the Dolphin Touch, we offer access to two different Swim with the Dolphin encounters, or we can sign up for Dolphin Trainer for the Day encounter. If adrenaline-seeking is your thing, we can set you up with on the Jamaican Bobsled, Skyride & Zipline tour. These three adventures will take you down Jamaica’s Olympic bobsled, high above the treetops and through the canopy of the gorgeous rainforest. Another thrill-seeker favorite is the 4X4 Off-Road Safari. You’ll go off-road to see the tropical lushness of the rainforest and valleys. A stop at water pools and historical sites makes this a well-rounded adventure! If your idea of a good time is taking it easy—not zipping around on a schedule, but lazing around with a rum drink in your hand—we’ve got that covered as well. Check out the Jungle River Tubing package. This sets you in some rapids, yes, but then you can laze around the lagoon on an inner tube with a guide who can point out Jamaican flora and fauna. The Bamboo River Rafting package sends you down three miles of the lush Martha Brae River on a 30-foot bamboo raft. History comes alive with the tours of either the Bellefield Great House or Good Hope Great House. Learn about the history of the island, sugar and rum production and enjoy music, dancing, and authentic Jamaican food on one, or both, of these historic tours. Call Dreamers Travel today and enjoy a Caribbean vacation of your dreams. Meta Read today’s blog and learn about the adventures you can have in Montego Bay, Jamaica when you use Dreamers Travel travel agency. Call us today!